Okay, I'll break the ice here. This post will serve two purposes: 1) Practice downloading here from PhotoBucket, and 2) to encourage anyone who puts together a blade not to be embarrassed by its appearance! I mean, if I'm not embarrassed to show these knives, I'm sure yours will shine by comparison. Anyway, this is a working tool I put together from a roughed out blank I found under my workbench. It was left by the previous owner, and undiscovered for many years. 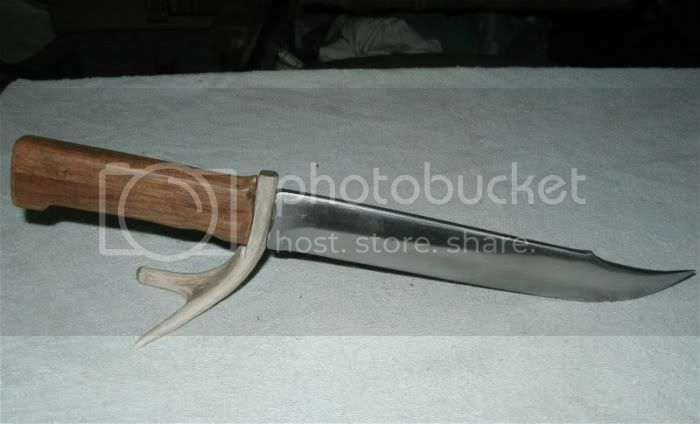 I fitted the blind tang into an old elk antler, and made the guard from a brass door hinge. Looks like hell, but it works. This is a novelty knife my son put together as a high school shop project. Hahaha! We now have a baseline upon which to improve! I'm likin' it. All hell would break loose if a kid made that in class in FL. I had a big stink in my classroom years ago when a student brought a 2" rubber knife in...and I mean a LITTLE wiggly rubber knife. Yep! It's a different world up here! The shop teacher helped him harden the blade in class. So many boys here make hunting blades that the instructor built a gas forge right in the shop! A kid in grade school in WA got in trouble for putting toy soldiers carrying guns in a school project diorama. looks great to me man!! thats a good 'un there! I love the door hinge brass! What a cool idea. I also think that knife is great because of it being lost and then found and completed... cool history! It looks a little hokey, but I actually wanted a bigger piece to keep from sliding up on the blade if I was ever unfortunate enough to have to thrust with it as a weapon. This is the original blank as I found it under the work bench. I took more material off the heel of the blade to make the tang longer/stronger. I like it, nice job!! Great looking knife, I love the fact that you brought it back from being forgotten, to being useful. Be Prepared or prepare to be lost. DON'T try this at home (or anywhere)! Here's a vid I did that should keep you awake at night. A short view of The Beast in action. I actually did draw blood during the filming of that video. I pinched my finger in the camera tripod when I was closing it up. I like your knife, OP, it's got character and looks to be very functional. It reminds me of the long hunter knives of the past - it would be a great scalper! Ha! Well, I wasn't going for looks, obviously. I liked the profile of the old blank just the way it was. I also wanted to NOT make it all shiny and new, but keep the 'vintage' look. It reminds me of something an old mountain man would have crapped together at a rendezvous on his way into the mountains. 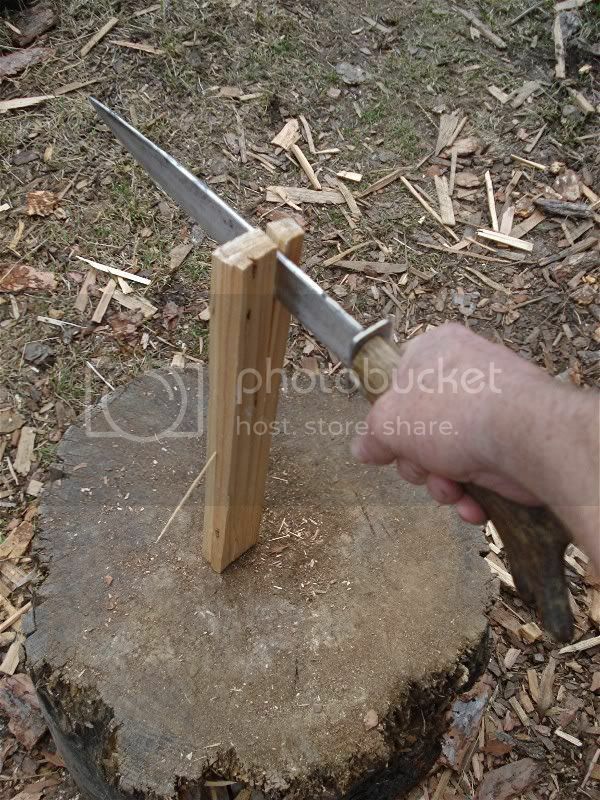 If it's not being used as a camp knife, or a digging tool, it can always double as a bayonet. Hahaha! I remember seeing this video before! It still makes me cringe a bit. But it sure makes quick work of the kindling. In all honesty, I made it more as a weapon, than a wood chopper. That's one aspect of knife making I haven't yet explored. 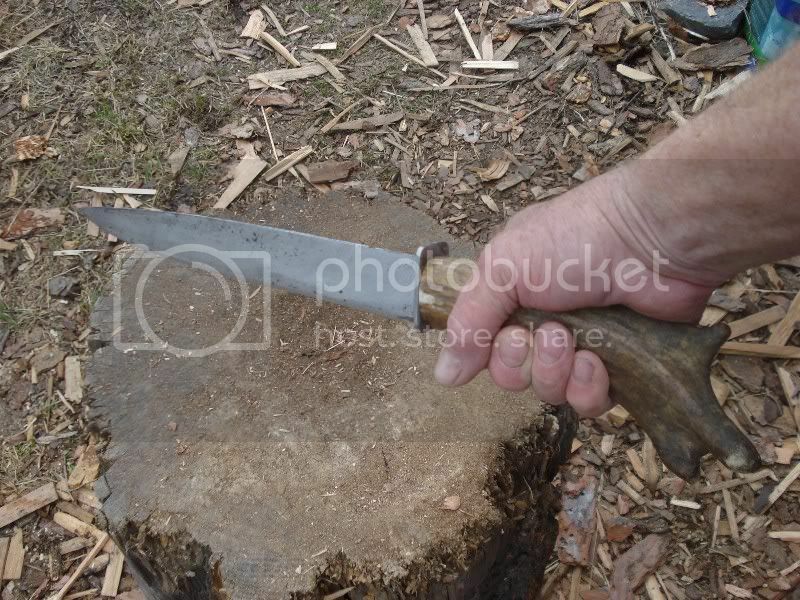 I want to make a double edged, hidden tang dagger with a nice guard and pommel and a wire wrapped handle. Something medieval looking. This thing doesn't look medieval, just evil. Hahaha. My finishing mod will be to sharpen the spine about 5" in from the tip. I posted my other thoughts in WW's knife thread. My next mission, if I choose to accept it, is to make some smaller "bushy" knives out of some old sawmill band saw blades I've had for years. I have two 25' saw blades that have been cut once so they're flat now. How thick is the steel on those old band saw blades? Just came accross this thread. Very nice OP. My first few blades were made from old metal files. That one looks great. It's awesome the school allows your son to do such a project. 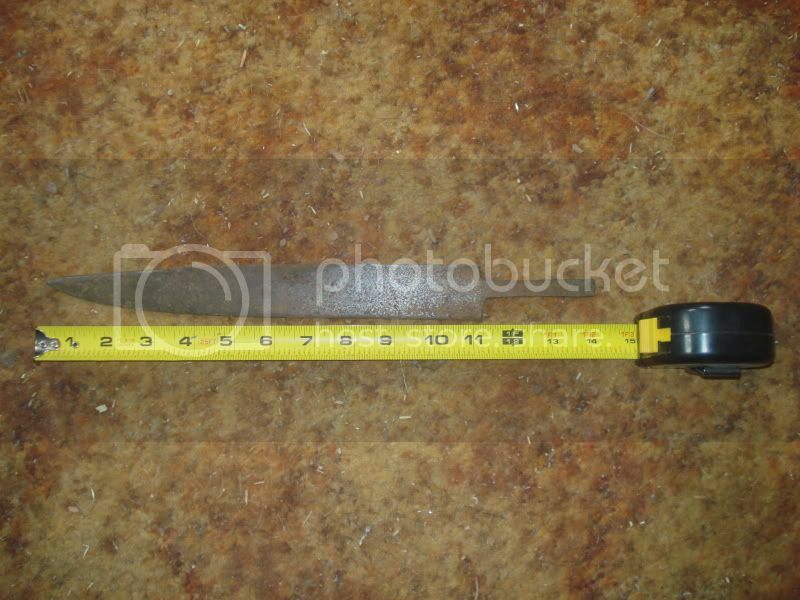 I have to measure one. Everyone keeps asking.